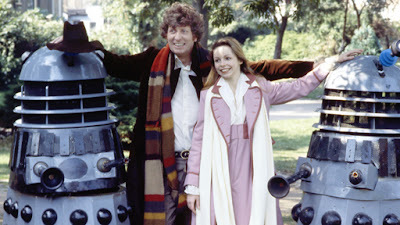 There is very little new in the Doctor’s wardrobe this year, but if there was a fashion trend developing this season, it would be for a more casual look, with unbuttoned waistcoats; open-collar shirts and loose hanging scarves. 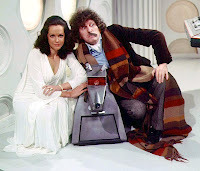 The mix-and-match on show plunders costumes originally designed for Terror Of The Zygons, The Deadly Assassin, The Image Of The Fendhal and The Power Of Kroll. None of these are worn as intended. This season also serves to demonstrate an almost distain for his fedora hat. More often than not is relegated to his coat pocket. Last season he only put it on an average of one scene per episode - during this season it is barely one time per serial, and as the season progresses he doesn’t wear it at all. The first half of the season was recorded out of order, with the Harris Tweed frock coat being his favourite coat of choice. 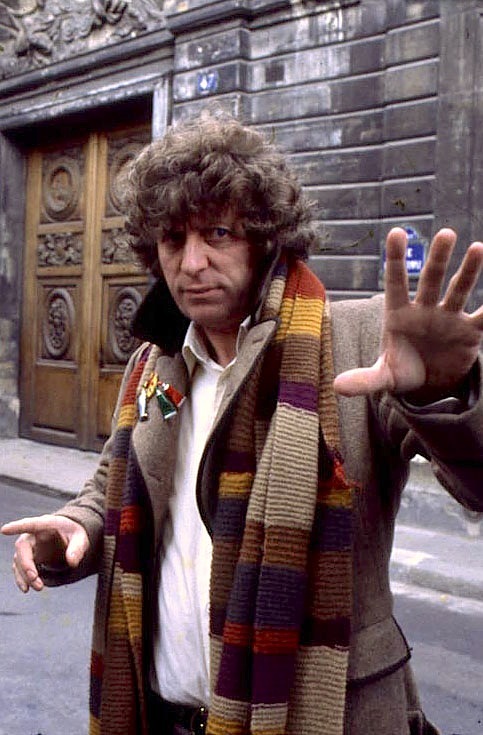 The Doctor opens this season wearing the light brown Harris Tweed frock coat introduced in The Power Of Kroll last season; worn over the Prince of Wales check velvet waistcoat worn intermittently since season 13, but now worn unbuttoned; with his ivory dress shirt first seen in The Image Of The Fendhal. He has a new pair of black-and-grey glen check trousers with a faint yellow overcheck. These are held up with the black belt that first appeared in The Deadly Assassin (with its silver grommets and round, brass buckle). 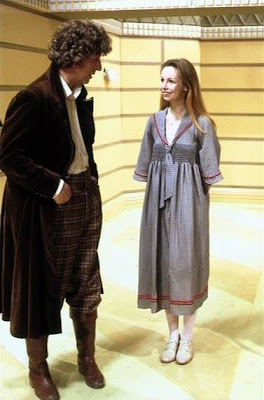 Although he hadn’t before worn such trousers in the show proper, he had worn similar glen check trousers in publicity photos and during dress rehearsals the previous year (see below). 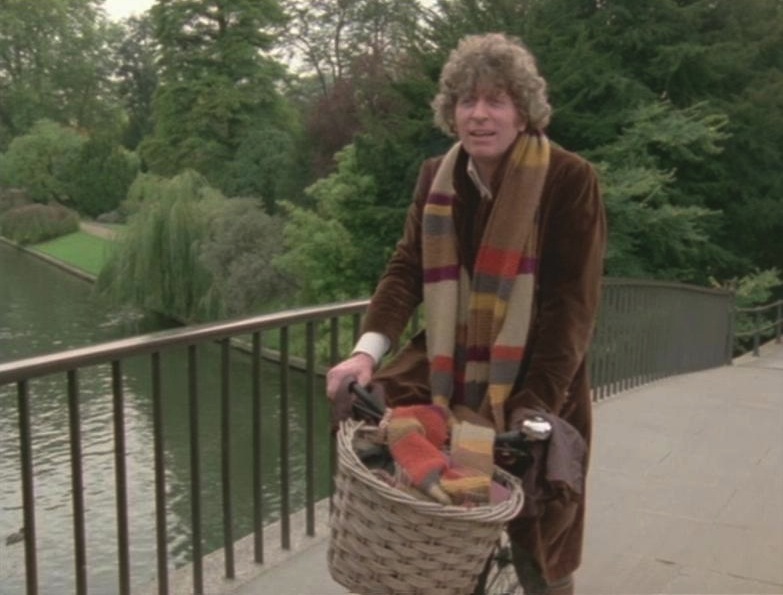 Finally he wears the double-length season 16 & 17 scarf as well as the brown leather cuff boots which like the belt, first appeared in The Deadly Assassin. He also has the brown fedora not seen since The Sun Makers, though it spends most of the serial stuffed in his coat back pocket. At the beginning of the serial Romana regenerates and wears a duplicate of the Doctor’s current frock coat and scarf (designed to be worn by Tom’s stunt-double), however she wears the frock coat buttoned up, showing that even if it was not tailored to be, it could if required. 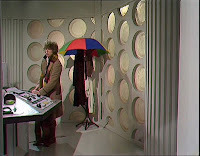 The console room hatstand has the chestnut brown velvet frock coat; what looks like the loose fitting shirt from The Deadly Assassin; the tapestry waistcoat from The Power Of Kroll; topped by the umbrella seen breifly in The Stones Of Blood. 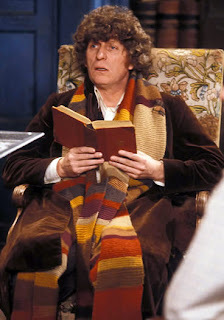 This season sees a minor running joke with The Doctor reading books carried in his coat pockets. 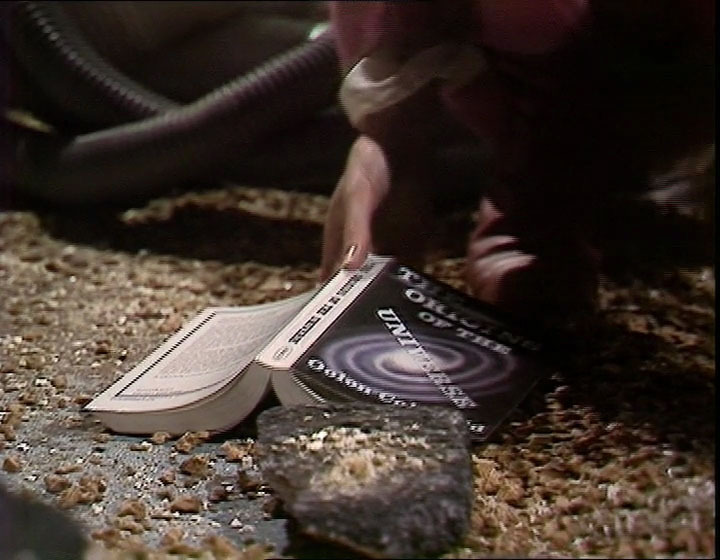 In episode one, while pinned under the fallen column, he passes time reading The Origins Of The Universe by Oolond Colluphid. The author is a character referenced in The Hitch-Hiker’s Guide To The Galaxy by Douglas Adams, who was Doctor Who script editor for this season. 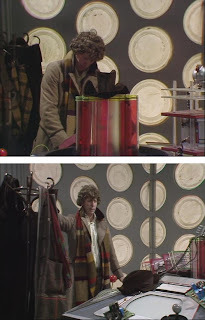 The Doctor continues to wear the light brown Harris Tweed frock coat with a palette-and-paintbrush pin on his right lapel (see left, top); again worn over the Prince of Wales check velvet waistcoat, worn unbuttoned (see left, second picture); with his ivory dress shirt. 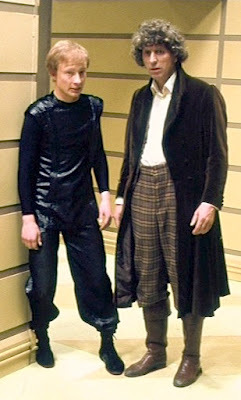 His new pair of black-and-grey glen check trousers, with the black Deadly Assassin belt (see left, third picture), are worn with the brown balmoral brogue shoes from Image of the Fendahl. This lets us see the trousers are cuffed at the ankle (see below). The costume is rounded off with the double-length season 16 & 17 scarf (see below). Aside from a brief moment in episode three (see left, bottom) his brown fedora hat is relegated to his coat back pocket. The frock coat, which has only been worn for a handful of serials, is already showing signs of wear and tear. 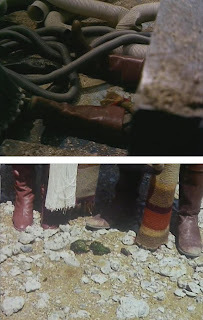 One of the buttons on the back of the coat is missing for part of the location filming (see left, bottom) and a small part of the back seam has ripped, which is move evident in The Creature From The Pit. 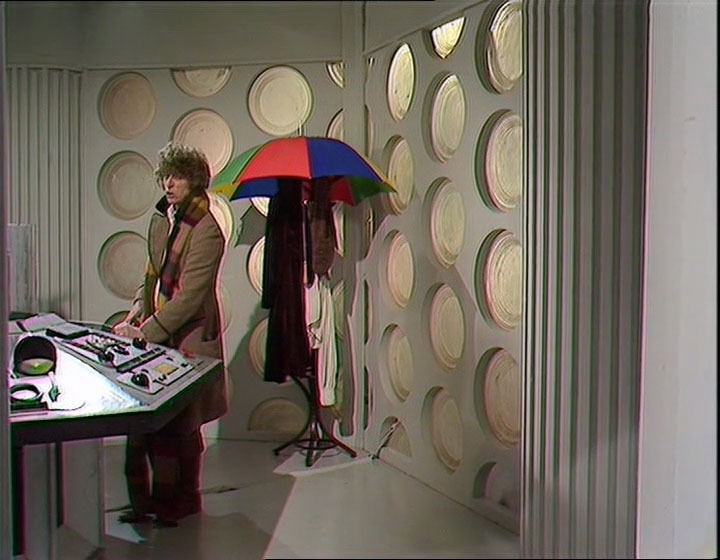 Being the first serial recorded this season, the Doctor’s costume is carried over from The Armageddon Factor with no changes. It comprises of the light brown Harris tweed frock coat; the fancy brown, green and gold tapestry waistcoat on only its third outing; off-white dress shirt, worn open-collared; weathered Blackwatch tartan trousers held up with braces; brown leather cuff boots; and the season 16 & 17 double-length scarf. He doesn’t bother with the hat for this serial. The waistcoat, worn unbuttoned, is hardly seen, though a quick flash of the inside of it can be seen early in episode one. 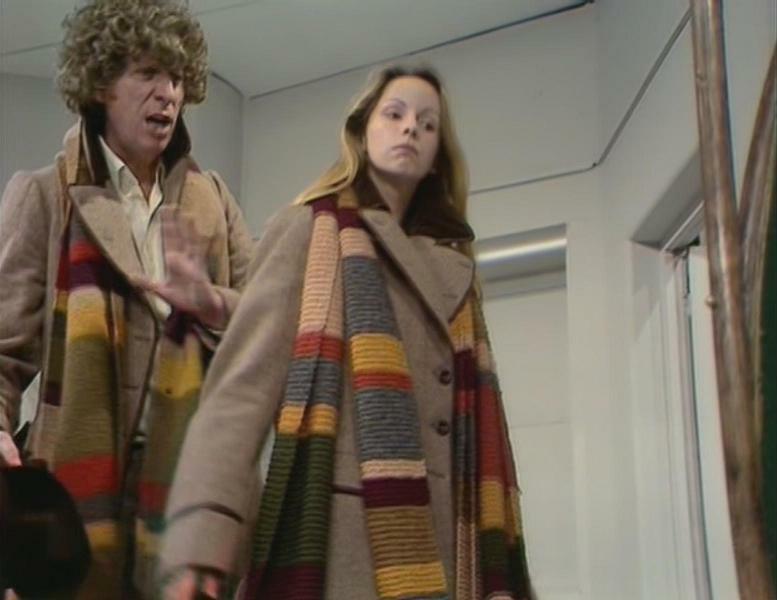 The damage to the Frock Coat is quite evident during this serial. For the most part one button is missing off the back of the coat (see left, third picture), and further up you can see where a seam has popped for about an inch (see left, bottom). The console room hatstand is pretty full this time, with the grey tweed frock coat; the velvet Prince of Wales checked waistcoat; a pair of trousers (probably the grey Donegal); and the deerstalker hat and tweed inverness cape from The Talons of Weng-Chiang (see right, top). Belatedly we get a good look at the multi-coloured paisley lining of the inverness cape when the hatstand falls due to a bumpy landing (see right, bottom). 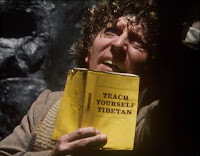 While trapped down the pit, The Doctor pulls a book from his coat pocket. Teach Yourself Tibetan is possibly a nod to the latter days of the Pertwee era and producer Barry Letts who was Buddhist. 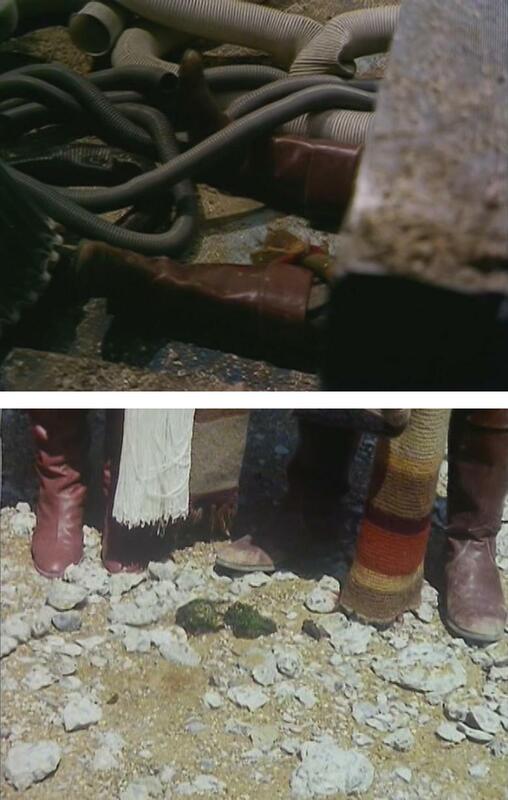 From the previous serial, The Doctor wears the fancy brown, green and gold tapestry waistcoat; off-white dress shirt, worn open-collared; weathered Blackwatch tartan trousers held up with braces; brown leather cuff boots; and the season 16 & 17 double-length scarf. His hat remains permanently in his pocket. However he now wears it with the chestnut brown velvet frock coat not seen since The Androids of Tara. The way the light brown Harris Tweed frock coat was worn has influenced his dress sense. He now wears the velvet coat with the collar flipped up and the scarf underneath his lapels. This serial also gives us the best view of his paisley waistcoat after he takes off his scarf and coat in episode three. We can see that it has a brown satin back with an undone half belt (see below). Lastly, in Episode four The Doctor gets his coat tragically torn to shreds by Mandrels (see below). The sleeves are ripped clean off; the back is torn open up the centre seam and hangs down with what is left of the front panels which also have been totally destroyed. It does give a unique insight into the horsehair interfaced construction of the front on the coat. The Doctor returns to the costume he wore at the beginning of the season: the light brown Harris Tweed frock coat; velvet Prince Of Wales check waistcoat, worn unbuttoned; off-white dress shirt; glen check trousers held up with the black leather belt from The Deadly Assassin; tucked into brown leather cuff boots; and the final outing of the season 16 & 17 scarf. 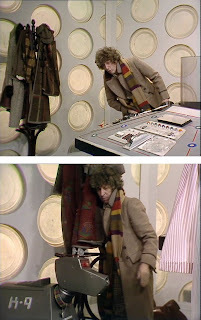 His pocket-crushed hat starts off on the TARDIS console, and only gets worn for one brief moment in Episode two before going right back in his coat pocket. On the console room hatstand he now has the chestnut brown velvet frock coat; a duplicate of his Prince Of Wales check waistcoat (he is wearing one AND there is one on the hatstand! ); and his mottled tweed inverness cape from The Talons Of Weng-Chiang. 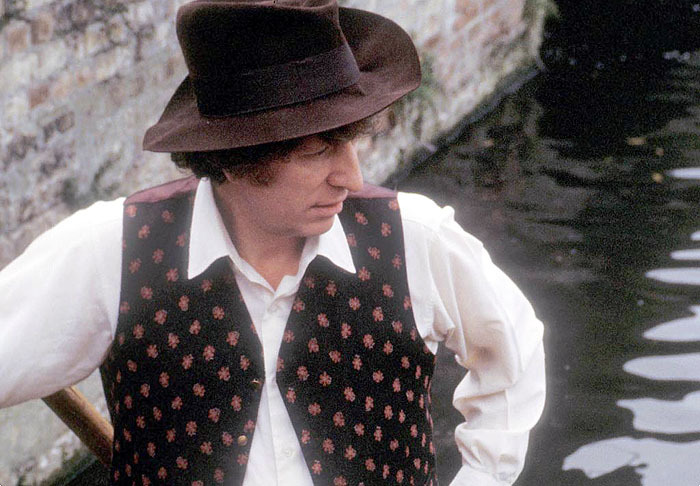 The surviving footage for this unfinished serial (an extract of which was also used in The Five Doctors) opens with The Doctor punting down the River Cam. He is wearing the ivory dress shirt; flora-motif waistcoat; grey check trousers; and brown leather cuff; and his brown fedora hat. His velvet frock coat and scarf are seen folded in the punt in front of him (see below). This scene gives us the best look yet at the waistcoat, introduced three-years ago in The Talons of Weng-Chiang. It has a brown, almost aubergine silk back and looks to have a half belt (see left, top). The trousers are similar to the previous serial’s, but the check is more subtle and lacks the yellow overcheck. They are also held up by a new brown belt with a square, gold buckle (see left, third picture). 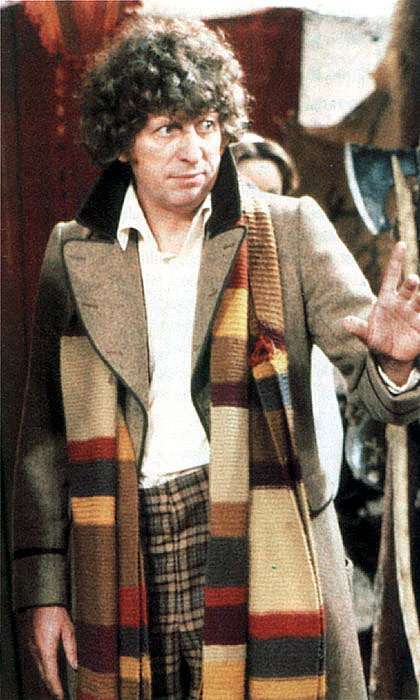 He soon regains his chestnut brown velvet frock coat and double-length season 16 & 17 scarf. The brown fedora hat is worn intermittently throughout the serial. His scarf his been heavily modified, with one section rearranged, the joins where sections had been removed newly crocheted together, new ends and tassels, and several large patches sewn over any holes (see left, bottom). The patches are cut from the velvet Prince Of Wales checked waistcoat. This is designated as the Shada scarf, and is the way it remains today.